With fully-furnished studio and 1-bedroom hotel apartments split into standard and deluxe suites, Reve offers accommodation options to meet just about any budget and need. Embellished with the latest décor, every room has a personalized touch to it that allows you to call it ‘home’. Each living unit comes with an LED TV, telephone, Internet facility, crockery, cooking unit, washer, refrigerator, safety deposit box and an open kitchen. Further, our 1-bedroom apartments also offer walk-in cupboards, giving you the additional storage space that you need for your goods. The standard studio apartment has size starting from 30 sqm. 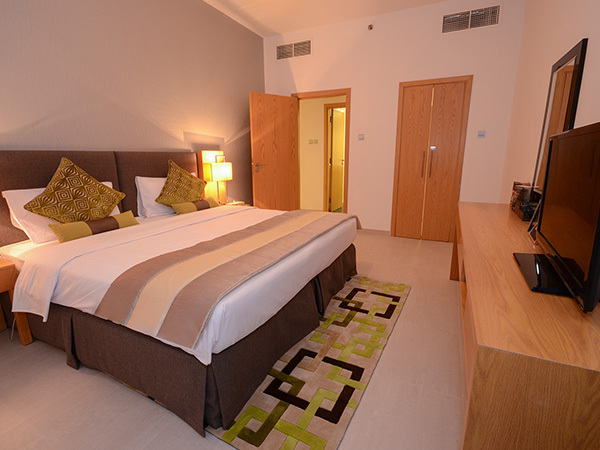 It comes with a king size double bed or two twin beds. It is set in modern, elegant décor and offers a pleasant ambience…. The size of 1-bedroom deluxe apartment starts from 65 sqm. It is a fully-furnished apartment that comes with all the latest amenities. It offers an elegant look and makes for an ideal home….. 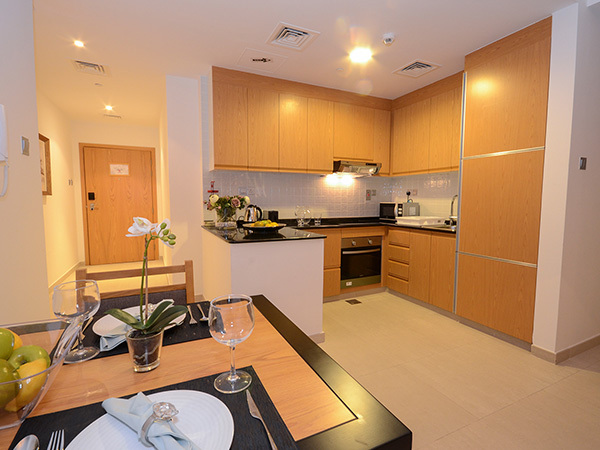 The standard studio apartment has size starting from 30 sqm. It comes with a king size double bed or two twin beds. It is set in modern, elegant décor and offers a pleasant ambience. The room is fully equipped with all the amenities and features you need. It offers a decent view of TECOM, Sheikh Zayed, and prominent skyscrapers in the vicinity. 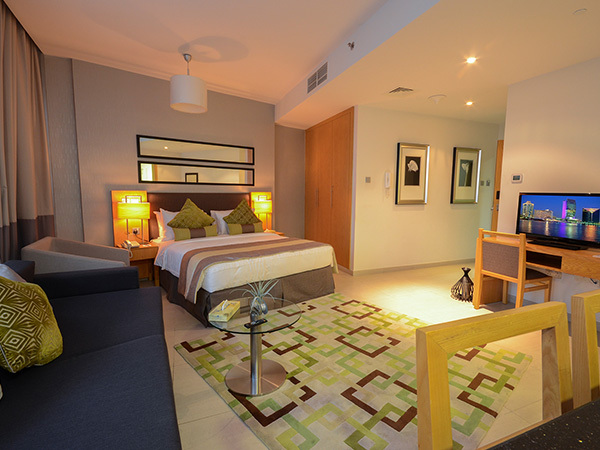 The size of studio deluxe apartment starts from 40 sqm and is fitted with a king-size double bed or two twin beds. It is fitted with elegant modern furniture and is extremely comfortable. The size of standard 1-bedroom apartment starts from 55 sqm. It is an elegant, spacious room set in tasteful, modern decor. 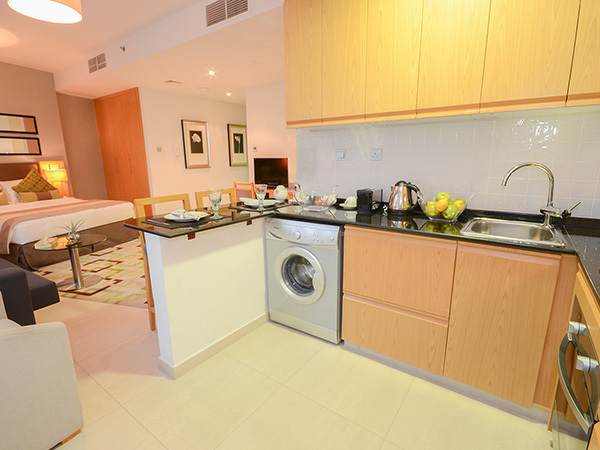 It offers a view of Sheikh Zayed Road, TECOM and open sea. Enjoy the additional space offered by walk-in cupboard for storing all your goods. The size of 1-bedroom deluxe apartment starts from 65 sqm. It is a fully-furnished apartment that comes with all the latest amenities. It offers an elegant look and makes for an ideal home. It also comes with additional storage space in the walk-in cupboard, allowing you to store your luggage.